The corporate world, success-oriented and competitive as it currently is, is becoming increasingly aware that peak performance at all levels requires the conscious acquisition of knowledge and training specific to each job. Our approach to work is more deliberate now than ever before, and it parallels in many ways the efforts of athletes as they strive for achievement. It is not surprising that many sports figures have turned to careers in business upon retirement, running their own companies or joining corporate teams at management levels. They bring to their new roles unique experience in goal setting and goal achievement. The sports world has contributed the effective tool of visualization to the business world. Management researchers have discovered that the visualization process, when consciously developed and used by athletes, leads to measurable performance improvement. Researchers exploring the relationship between imagery and perception have discovered they occur simultaneously in the brain. Imagery can be substituted for actual practice while performing an activity. The specific activity they hope to succeed at (such as strengthening their backhand stroke, asking for a raise, interviewing for a new job, speaking before a group, presenting a sales pitch, or negotiating a contract). The environment in which the activity will take place (such as a crowded stadium, unfamiliar gymnastic equipment, size of an audience, or distractions in the home of a salesman’s client). The goal (such as winning next week’s game, winning an Olympic gold medal, or signing a contract). Mitchell isolated that split second as the point “when your feet are pushing off and your arms are throwing.” She attributes her winning performance to the visual practice of her particular pivotal moment and its effect on her physical abilities. Business situations often involve pivotal points as well. Contract negotiations require a strategy based on awareness of a key demand and a key concession, elements upon which negotiations either break down or proceed to the mutual satisfaction of all parties. Similarly, conflict resolution between staff and supervisors depends upon a six-step process, the most important of which is to see the problem from the other person’s point of view. Visualization techniques can be used to isolate and overcome those obstacles on a case-by-case basis when the participants are willing to examine situations in detail, paying strict attention to everyone’s vivid descriptions. Recognition of and commitment to the goal is just as important in visualization as awareness of details and pivotal points. On a simple level, the archer who visualizes hitting the bull’s eye with his arrow mentally reinforces his belief in his ability to achieve the goal. In the same fashion, a salesman who wants to get an appointment with a prospective client may envision himself writing the appointment on his calendar before he makes the call. Schmidt draws upon past skiing experiences, remembering vivid details that involve all of his senses, to visualize future success. He deliberately reinforces the feeling of success to improve a performance he cannot literally, physically practice. It is far more common, however, to find individuals mentally rehearsing both the pivotal point and the goal image. When people learn new activities, they receive basic instruction, isolating pivotal points and defining goals. Whether learning to bowl, type, or give a speech, they move back and forth, holding momentarily the pivotal point image and then the goal image in the mind’s eye. For example, a customer service representative visualizes going through the motions that project a positive effect to an irate customer. He sees himself smiling, calmly asking pertinent questions, repeating the customer’s responses and feedback in an understanding manner, and validating the customer’s feelings and needs. He balances the particulars with an image of the goal: solving the problem for a smiling, satisfied customer. Some visualization techniques focus on self-image and self-esteem in addition to specific activities and goals. 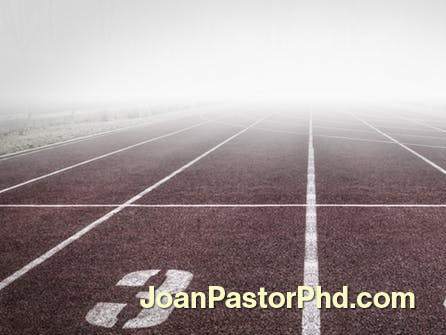 It is important to align the individual’s belief system to the achievement of the goal. Positive messages must replace negative messages; the athlete and the businessperson must expect success rather than failure. The words people use during conversations with themselves determine thoughts, feelings, and images they have of themselves and, ultimately, their behavior. “I don’t deserve the promotion,” or “I don’t have what it takes to be a manager,” or “I can’t have a career and a family,” are all negative statements that hold us back. Natasha Josefowitz, professor of management at San Diego State University, asks her students to visualize themselves five years in the future, write their scenarios and submit them to her. Consistently, women preface their answers with the words, “I hope to …” whereas men write the words, “I plan to …” Both sexes may be equally ambitious, but their belief in themselves clearly is not equal. Thought-stopping is one of the devices used to change negative thoughts to positive thoughts. Sports psychologist Don Greene worked with diver Michelle Mitchell, training her to stop visualizing the worst scenarios. He told her to yell: “Stop the film!”, mentally rewind to its beginning, replay it slowly, and recreate the key point until it is recorded successfully. Anchoring is another tool used by athletes to transform their expectations. Once the negative image has been identified, the person looks for a particular sound or sight or touch with which he can associate a positive image to replace it. The replacement image must feel real, its true appearance guided through the imagination of vivid detail. Each time he encounters the negative imagine, he conjures up the detail, or anchor, that reminds him to replace it with the positive. A dramatic example was told by Rosyland Fairbanks, ranked 25th in the world in women’s tennis and ranked first in South Africa. She took the French Open doubles title twice because she convinced herself the hostile crowd applauding her opponent was in fact a friendly crowd applauding her. She made up her mind that support for her adversary would fail to rattle her, using the sound of their applause to her own advantage and making her belief in a lie the source of her strength. A financial planner, finding himself unable to concentrate while studying for the Series 7 exams, might choose an anchoring device to change his lethargic attitude into a more enthusiastic approach. Using all of his senses, he can focus on the positive, comfortable features of the room in which he studies—the cushions on the chair, the feel of the wooden desk, and the smell of coffee brewing. Then he can associate those sensations with the positive feelings of understanding and enjoying what he’s learning, combining a tangible sensation with the experience of accomplishment. In sales, both thought-stopping and anchoring play a crucial role. A sales representative must recognize and stop the negative message he hears as soon as objections are raised. Mentally rehearsing positive replacement thoughts helps him recover a positive attitude more quickly. A sales representative will anchor by using all of the knowledge he has about a prospect to guide him mentally as he rehearses his pitch. By the time he’s face-to-face with the customer, he has a strong mental image but can remain flexible as the conversation evolves. It’s important to continue adding to the accuracy of the mental picture throughout the discussion. The deliberate concentration keeps the salesman feeling active and engaged. The feeling of vitality, in turn, enhances the customer’s experience and increases the likelihood of a sale. Anchoring also can be used to prepare for speech presentations. Many managers, especially engineers, lack the necessary skills but are expected to give oral presentations on progress (project managers in particular). Managers often need to sell their ideas to the budget planners. And they have to account for what their departments are doing. Industrial psychologists advocate a program that includes progressive relaxation and the mental review of a script the managers have written (based on past experiences). Managers are instructed to associate the deep breathing exercises of the relaxation techniques with the imagery of the successful presentation. After two weeks of frequent practice, both body and mind respond automatically to the controlled-breathing rate. Managers’ presentations are less self-conscious; tension, anxiety and stress are significantly diminished; and the public expression of ideas becomes almost effortless. “Reality testing” is another method used to alter expectations of achievement. A capable executive may not feel capable and will avoid taking risks and asserting authority. The people around him see his strengths and are frustrated because he holds himself back and fails to respond to situations because he lacks confidence. Such cases require feedback from colleagues so a new image, based on accurate information, can be created for the underachieving administrator. When confronted with a high performance rating from his peers, he is gratified to learn that he actually has performed better than he imagined. Greater confidence in his own abilities has a powerful effect on his future performance. The imagination plays a crucial role in an area which applies to everyone from athletes to artists to businesspeople—creativity. Much of what we learn can be perceived as skill, or task-oriented. Just as common, however, is the need for innovative ideas, solutions, and decisions. A tennis player who consistently has trouble with his serve may try to strengthen his performance by asking the coach for feedback and instruction, watching videotapes of his own and others’ performance, visualizing his improved serve, and focusing on the problem during physical practice sessions. Then, at a moment when he’s not consciously concentrating on the problem, everything falls into place. The alignment is perfect and the serve works. The tennis player has experienced that elusive pivotal point in the creative process itself call incubation. That’s the time period when the mind apparently ignores the problem and all the data connected to it. While the mind “rests,” his attention deliberately turns elsewhere (perhaps to some routine activity). When he comes back to the problem, he realizes he has come up with a solution. Managers can use this approach whenever planning is called for. For instance, a manager may be creating an activity plan for an employee whose performance is suffering. He’s not sure how to approach the assignment and has no strategy. He isolates the problem while brainstorming with colleagues. He has come up with a few ideas and jotted down some notes. At this point, it is necessary to table the decision and move on to routine matters. Hours later, the solution surfaces in the manager’s mind, and he can make a decision. It is important here to avoid moving too quickly. And it is also important to write down the results, especially when working with multi-faceted plans. The problem’s complexity often will determine the time spent and the number of stages involved in its processing. Executives have found it helpful to carry notebooks or tape recorders. It is when the mind seems to go into “automatic”—while driving, just before going to sleep—that great ideas often surface. Committing ideas to paper or audiotape allows them to be stored for later review. Visualization techniques must be part of the corporate mission statement. Typically, the company president is the company. And his vision must be communicated as powerfully as possible to all employees. They must have a clear vision of the role they play in achieving corporate goals. Employees must know that the company’s strategic plan will change from time to time. Recently a high-tech corporation found itself losing ground because industry conditions had changed since it began making its product. Initially, the product was in such demand the company paid little attention to sales efforts and efficiency issues. Managers focused exclusively on production and research and development activities, which conformed to the company mission of providing high-quality research and product development. The company expanded, anticipating consumer needs and adding to its product line. But when consumers demanded better, more sophisticated products, the company floundered. A four-step process known as the “communication loop” solved this company’s problem. The first step required top managers to revise and clarify the corporate mission statement. They asked themselves whether the customer needed fast delivery, personal attention, or a more accessible product. They ranked customer needs according to priorities. Their mission became more service-oriented. Several key mid-level managers were asked to aid in the discovery process. Mid-level managers were helpful in forecasting changes because they were in a better position to recognize problem areas. The second step involved communicating the revised mission to all employees, so they would have a clear picture of company goals and their contribution to them. Through the third step, management created programs within each department which supported the corporate vision, and trained staff to meet appropriate departmental goals. Success in this area resulted in higher levels of pride and loyalty as well as a sense of shared values. The fourth step called for top management to institute communication procedures that brought them feedback from the bottom of the hierarchy. Top managers discovered the usefulness of information from employees who work most closely with the customer. Opening up lines of communication so that information filtered upward gave decision-makers an edge in anticipating changing industry needs. Arriving at a clear mission statement requires a level of reflection that is only recently being encouraged in corporate America. For individuals, it means believing in their own competence, focusing on mobilizing skills, and aligning with an organization or team. Stress management in the workplace and workplace stress relief are hot topics these days. 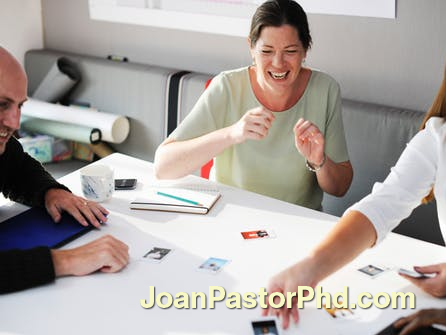 As an industrial-organizational psychologist (a fancy name for shrinks who help businesses and the people in them to thrive), Dr. Pastor sees the need for teaching clients how to de-stress. Workplace stress is real. Learning how to manage stress at work requires some unique stress management techniques. First, identify your most successful stress management techniques outside the workplace. All the things you can do in other settings can work at work, and some techniques take time and lots of practice. For example, we all know that exercise and stress are a match made in heaven for those who want to feel better and reduce anxiety. But did you know that using certain imaging techniques and practicing them first outside of work gives you a great deal more self-control when it all gets to you at work as well? Learn more about imaging techniques in the anxiety and anger management sections of Dr. Pastor’s clinical therapy site, The Healthy Brain and Body Centre of Beverly Hills. Along the same lines, invest in a good stress-management workshop. Take several of them, as each teacher will have his or her own slant and you can learn a lot over time, finding those stress reducers that work for you. You may want to learn little games to help manage the daily irritations of job stress. For example, if you are stressed out because of deadlines, try to turn the stress into something fun. Are you a competitive person? If so, set a timer and tell yourself—better yet, tell another person—what exactly you will accomplish between now and the moment that timer goes off. Even if you don’t accomplish it all, you will have done a lot, and for many individuals this creates a type of positive stress called eu-stress. Make sure you reward yourself for your accomplishment—especially the accomplishment of making boring or unpleasant work a little more fun. Always give yourself at least a verbal reward for that. If you are miserable just in this job, or just under this new boss (when it was hunky dory before), or only because of new job responsibilities you have taken on and don’t enjoy, think about a change. Yep, consider changing jobs, even consider changing companies. If you don’t do this often, or if you are considering a big change, do yourself a huge favor. Make sure to go to a qualified and licensed business psychologist for vocational and personal profile testing. Even if your job is fine but you find you no longer are fine in it, that may mean it is time for a change. Congratulations, you’ve grown! But promise me you will look at vocational and related testing first. It is not that expensive, and it can save you a ton of time, money, and STRESS while giving you much needed support at the same time. Make the most of workday breaks. Even 10 minutes of personal time will refresh your mental outlook. Take a brief walk, chat with a co-worker about a non-job topic, or simply sit quietly with your eyes closed and breathe. If you feel angry, walk away. Mentally regroup by counting to 10, then look at the situation again. Walking and other physical activities will also help you work off steam.